20% OFF + Extra $10 Need Supply Co. Coupon - Verified 37 mins ago! If you're searching for high quality curated fashion, with a vintage edge, the Need Supply Co. can get the job done without leaving you out of pocket. Their selection of men and women's apparel and accessories can be purchased easily online, and if you redeem a special Need Supply Co. coupon, you can make great savings on your order. Here at Coupofy our team have collected all the latest deals on one page, so whether you want sale info or the latest Need Supply Co. promo code, you no longer have to waste time searching on the web. Just scroll through and click the one you want to use. If vintage fashion and accessories are not what you're looking for today, then make sure to check out our collection of other great offers, covering all the most popular online stores and service providers on the internet. Remember, you never have to pay full price again when you shop via Coupofy! Get notified when new promo codes arrive from Need Supply Co. Details: Winter Select Sale! Get 20% off select items. Items include housewares, accessories and apparel from brands like Farrow, Just Female, Cult Gaia and more. Need Supply Co. is a popular niche fashion retailer, based out of Richmond, Virginia, United States. They focus on a smaller but dedicated range of high quality apparel and accessories, from both large and independent designers across the globe. They sell their range through their flagship brick & mortar store and online at NeedSupply.com. The company cater to customers in the United States and those overseas, offering prompt home delivery and free returns and exchanges. While they don't have a mobile app you can easily shop online with your phone using the web browser. One of the most common ways to make savings when shopping at the online store is to use a Need Supply Co. coupon. Their variety of offers and deals has helped them grow the website to the popularity it has today. Whenever you're ready to make an order just remember to load this page to see our list of up to date and valid codes here at Coupofy. Need Supply Co. traces its roots back to 1996 when they found a niche selling vintage Levi's jeans in Virginia. As their popularity grew they began expanding it to other elements of fashion, while maintaining their vintage edge. Instead of a one size fits all approach, they curate their items and have developed a full blown lifestyle brand out of it. The online store was launched in 2008 and is now a key driver of sales. "We believe in creating a unique retail experience, both in store and online. We believe in connecting our guests with the designers they love. We believe in great ideas, and doing things a little bit differently," reads their about page. Need Supply Co. was founded by Christopher Bossola, who still serves as CEO today. According to public data they make between $500,000 and $1 million in yearly revenue, with a small permanent employee base. The online store currently serves the US, Canada, UK, Denmark, Japan, Norway, Sweden, and other countries in Europe. This is all done from the single website, so you only need one Need Supply Co. coupon. Need Supply Co. offer a broad range of fashion clothing and accessories, for men and women of all sizes. There are also gifts that compliment the vintage lifestyle for him and her. Their stock of carefully curated items are sourced from both well known and lesser known independent brands, at various price points, and you can reduce the price of most orders by using a Need Supply Co. coupon during the online checkout process. The Need Supply Co. promo code you choose from our collection will depend on what items you want to purchase, the type of offer you prefer, and what deals are currently available at the time. For example some coupons might be applicable site wide, but others can be reserved for certain items only, or you must meet certain terms (such as spend X amount). If you click on the Need Supply Co. discount code you want to use, the full terms will be revealed to you. Types of clothing available at the store include Shirts, Tops, Outerwear, Bottoms, Denim, Underwear, Tees, Dresses, Skirts, Jumpsuits, Sweaters, Intimates, and more. Types of Shoes include Sneakers, Sandals, Boots, Casual, Dress, Flats, Heels, Slides & Mules, and Oxfords. You can also purchase Bags (totes, backpacks, wallets, clutches, shoulder), Jewelry (watches, necklaces, bracelets, earrings, Beauty Products, Male Grooming, and Accessories like Sunglasses, Scarves, Gloves, Headwear, Ties, and Belts. Lifestyle and Gift products include items for Travel, Tech, the Kitchen, Office, and even Paper Goods. While they change from time to time, some of the current bestsellers include the Huron Mesh Moc-Folk in Black Sneakers, Concealed Placket Shirt, Citadel Parka in Navy, Short Knitted Hat in Grey, Beaumont Cuff in Sterling Silver, and many others. Popular Brands available include Comme des Garcons, Jesse Kamm, Editions M.R., Common Projects, LoQ, Herschel Studio, Engineered Garments, Acne Studios, Adidas, Ganni, MHL, Loeffler Randall, J.W. Anderson, Lemaire, Alden, Just Female, A.P.C., KARA, Gitman Brothers Vintage, Martiniano, and many others. If you want to give somebody else a gift but don't know what to choose, you can also purchase a gift card. These come in values of your choosing and can be sent to you or directly to the recipient. The site also has dedicated pages for sale items. You can reduce these prices even further if you combine them with a Need Supply Co. coupon, which is applied during the online checkout process. 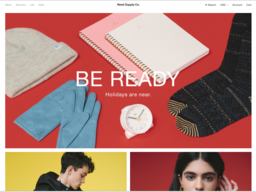 Money Off At Need Supply Co. Sales: Regular sales allow you to browse the sales page for discounted items. These will run for a limited time or until the stock is all gone, so be sure to snap them up fast. You do not have to do anything special, simply add them to your cart and checkout to benefit from the sale price. Coupons: A Need Supply Co. coupon will reflect a certain discount or deal. You must use the code on the site to redeem it and meet the required terms. You can only use one need supply discount code for 2016 per order, so make sure to choose one that will get you the best deal! Shipping Offer: If you spend over a certain amount you can qualify for free standard shipping. A special Need Supply Co. coupon might also sometimes be available to get free shipping regardless of what you spend. Affiliate Program: The store allows you to make extra cash on the side just by referring your friends and web users to make purchases. If you sign up to be an affiliate they will issue you with various web links and banners that track your referrals, and if you drive new paying users you will be paid commission. New Customer: New customers are often treated to an exclusive discount on their first order. All of the latest publicly available offers are listed right here at Coupofy, but you might also find some exclusives by following them on social media. They have profiles on Instagram, Twitter, Facebook, Pinterest, Twitter, and Vine. You can also sign up to their email newsletter that will give you 10% off your next order with a Need Supply Co. coupon. They will also periodically send out other deals. To place an online order at Need Supply you should first register an account. This will only take a few minutes and will allow you to save your details for future use and check your tracking and order history. They use a standard digital cart and checkout system, so you will have no trouble if you've made online purchases before. To help you find what you want everything is organized in to categories and subcategories for men and women, and there is also a search bar at the top of the page where you can enter keywords, brand names etc. Product pages feature a description of the product, several photos so you know what you're buying, user reviews and ratings to help you make up your mind, and a size guide. To add an item to your cart just enter a quantity, choose your size and color, and hit the button. You can then go to checkout by clicking the cart icon at the top of the page. Just prior to the payment step will be a special box where you can enter a Need Supply Co. coupon. Once you have done shopping you might also want to check out their blog, which features style tips and lifestyle topics. If you wish to redeem a coupon code from Coupofy or elsewhere to get a discount, there is a special promo box before you reach online payment where you can paste the code. As long as it is in date you will receive some kind of confirmation notice and your overall order cost will drop according to the terms of the promotion. You can only use one Need Supply 2016 coupon per order, but they can often be used in conjunction with regular sales for even more savings! Need Supply support all common credit cards, including Visa, Mastercard, American Express, and Discover. You can pay on the site itself through their secure gateway, which utilizes your card issuer's own security steps, such as Verified By Visa and Mastercard Secure Code. If you have a Need Supply gift card you can easily enter the code within your online account or during checkout. The balance can then be used to cover all or part of your order, with any remaining charged covered by another accepted method. The second method is Paypal, which allows you to use any funding option you have available in your account. This will take you away momentarily from NeedSupply.com. Need Supply cover the 48 contiguous US States, APO/FPO, Alaska, Hawaii, US territories and PO Boxes. You can also go to the international link to find out shipping charges and times for overseas. Within the US Standard Shipping will take between 3 and 7 business days and costs a flat fee of $7.95. If you currently spend over $75 in one order you will qualify for free standard shipping without having to use a Need Supply Co. coupon. If you want your order faster and your address is in the lower states, you can pay $4.95 for Expedited (2 to 3 days), $15 for guaranteed 2 Day, and $30 for Next Day. Orders placed Monday through Friday by 12:00pm EST (excluding holidays) are shipped the same day. You can check the status of your order and any relevant tracking information from within your online account. You will also receive various notices by email. Need Supply have a no questions asked return and exchange policy, allowing shoppers to return any unused item within 30 days of the delivery date for a refund, store credit or exchange. Original shipping charges are non-refundable unless you are returning an item that arrived damaged or in error. Returns are free if you send the package within 7 days in the US, using the packed return form and prepaid label. After that you will incur a fee of $9.95 unless you are returning an item that arrived damaged or in error. If you have opted for a refund, this will go to the payment method you used to make the purchase. Of course if you have used a Need Supply Co. coupon to get money off your order, that percentage is not included in the refund. International orders may be returned using any method of the customer's choice, at their expense. Get notified when new discount codes arrive from Need Supply Co.